The evening before you leave on your camping expedition, pack up your guns, ammo, chainsaws, explosives, fishing equipment and your cooking gear first because that stuff is really more important than eating. If you forget the food, you can always hunt things. Or chainsaw something. 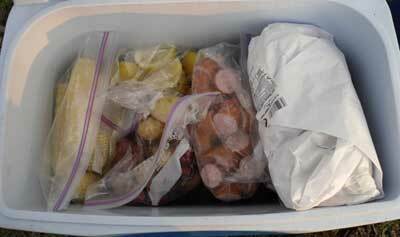 Once that is done, take your sausages and slice them into 1 inch wide chunks and place them in a zip lock. Clean the potatoes and shuck the corn and put them in a zip locks. Quarter the lemons and…put them in a zip lock (no more zip locks…really). The morning of the trip put them on ice and head for the hills. Upon arrival at your favorite camping spot, unload your guns, ammo, chainsaws, and explosives. Open a beer and proceed to blow things up until you are nearing the point of starvation. Now it’s time to get things going. Open beer. Remove the basket and fill your 30 quart pot up to the fill line (about half) with drinkable water. Dump in the 3 bags of Zatarain’s, a couple pinches of the Nantucket Shellfish Boil, a third of the liquid crab boil, and all of the lemon wedges. Bring to a rolling boil. Open beer. Once you achieve a rolling boil, dump in your potatoes and sausage (use your gloves, the lid is hot as hell). Boil the sausage and potatoes for 20 minutes. Open beer. At the 20 minute mark, dump in your corn and boil for another 10 minutes. At that time, dump the shrimp in and stir. Boil 3-4 minutes until shrimp are pink. Everything is done! Open beer. Spread out some newspaper and dump everything in a big pile (get ready to catch rolling potatoes when you dump it, we always lose a couple). Chow down! If you would like to turn it into a crab boil/shrimp boil, just toss in your crab after the first 10 minutes of cooking! LOL…it’s hard to make it in anything else 🙂 I suppose you could make it on the stove, but what fun is that? Honestly though, that boiler was one of the best purchases I’ve ever made. I always screw up the timing when I’m smoking stuff and I can whip that thing out and keep the mob from pelting me with stones. 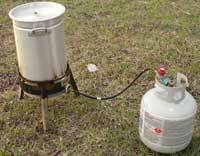 Plus it can be used as an outdoor fryer. I’ve done turkeys in mine, and they turn out great!!!! ah, if it only weren’t for bills. It’ll probably be June before I can get that rig and a smoker. The worst part about having just the four of us eating was the unavoidable 7 or 8 leftover potatoes that we just couldn’t cram down. They ended up being used as the deadliest cod ball ammunition. Apart from that, another solid boil, Chron. Got a problem: I’m getting new comments to this via email but when I visit here to reply/read them, I only see the first three comments. I’ve cleared browser cache and all that, any ideas? Joseph, yea something is up with my cache function…trying to figure it out. Aaron: regarding selling plasma: can’t, former cancer patient and other factors prevent me from doing so. Aaron: Probably better that way. Do we really want folks to know exactly what goes on behind the scenes at one of our camping trips? Hell no, I’m quite sure we’d all be in federal prison. Now that’s the sort of camping trip I want to go on! Now how a leftover potato wound up in Flynn’s pocket, I’ll never know. I think that was a one in a million shot from a great distance. It was a great spread, as always, Chron, and well worth a blog post. However, there needs to be a warning about the baby spuds and the level of power needed to smash them on the table as we don’t want to be liable for any broken hands. On top of the news paper, a good layer of visquine sheeting protects the table and is handy in a million different situations. Too bad Flynn had to break off in mid-gorging to figure out his limit. Remember folks, keep eating because when you take a break, it’s hard as hell to get back on that horse no matter how good the grub. True champions keep eating until it’s all gone. Love the “43 beers” in this recipe! A winner! Joe – Your name translated from Hungarian means “Big” right? Or rather “Tall”? 1) 43 beers isn’t enough, are you crazy? 2) No punching the Potatoes. Headbutting is much more manly. 3) You forgot to include “The Alphabet of Manliness”. You need that. To get this, go to http://www.thebestpageintheuniverse.com. 4) You need Pantera playing in the background. Pantera is awesome. 5) Also, bacon explosion needs to come along. 6) Dogs are necessary for any camping trip. That’s great Joe! I came in 2000 to this country. Grew up in Timisoara, Romania, speaking Hungarian. Great to find your lovely blog!!! Thanks Gabi, and thanks for the compliment about my blog. I don’t use it as much as I used to. This really brought back memories of Crawfish Boils we used to have when I was in Louisiana. Good time! Great recipe for this time of year especially in the south!! I bet this would convert for Crawfish pretty well! Indeed it does convert easily for crawfish boils. I’ve done it several times and it comes out great! We’re lacking in decent crawfish here in Kansas City though so I usually have to stick with shrimp. Just wanted to thank you for posting this recipe. I made it yesterday evening. 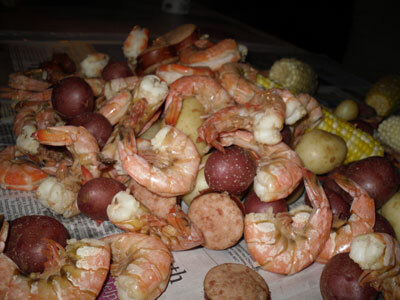 Everything came out perfect and it was my first time using my outdoor cooker AND my first shrimp boil. I used 3.6lbs of prawn from Costco which tasted great! Easily fed 9 adults and we couldn’t even finish all of it. Great that you posted this on Twitter, where I originally found it. 43 beers, is that enough? The shrimp looks great, I’ll give this recipe a try. Thanks. We were able to get by with 27 beers and 3 bottles of wine (for the women). I love this site! I am living in Maine, and most people just want burgers…I BBQ up a lot of ribs though with my own recipe and I have won a few ribbons with thus far. This site rocks! I like this as it is very different from the norm here. I think this would be great with Lobsters! ps. Thanks for not letting the beer issue be forgotten! Beer is essential in all of this! Just an FYI for the guy that said you can cook this on a stove in the house…DON’T DO IT!!! The crab boil pouches have some wicked spices that shouldn’t be release in a confined space. I boiled some shrimp in the house one October when it was too cold to be outside on the patio. Everyone’s eyes were burning all night long. This is definitely an outdoor recipe. @Rick – agreed completely. Your house will smell like shrimp for a week. Although, there is a new piece of equipment coming out that is an indoor fryer that can be used. It’s not on the market yet but they’re sending me one to try out. We’ll see what happens, although I’m not very optimistic. Loviong this recipe, I have a few camping stoves which I am going to try out soon with a few friends, will pull up this and give it a go! Great article. Makes me hungry. I’m sooooo hungry after reading that! Everything on this blog makes me want to eat eat EAT! Why is it so fun to look at pictures of food?!?!?! My first time making this & it was very good. Thanks so much. 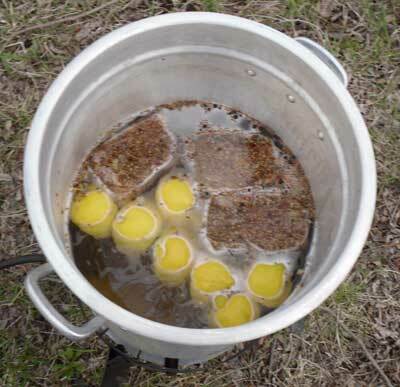 Great recipe- i have a question for second batch as I’m going to host a boil for about 20 people. Do you think it’s ok to reuse the water for the first batch? Ie after i pull out the good stuff in the strainer, I could get that water back to a boil and just redo the whole process? Or do I need to use new water and spice etc?